Many questions regarding the Sun's magnetic field are still unanswered. "As with the Earth, we are dealing with a dynamo. Through self-excitation, a magnetic field is created from virtually nothing, whereby the complex movement of the conductive plasma serves as an energy source," says the physicist Dr. Frank Stefani from HZDR. 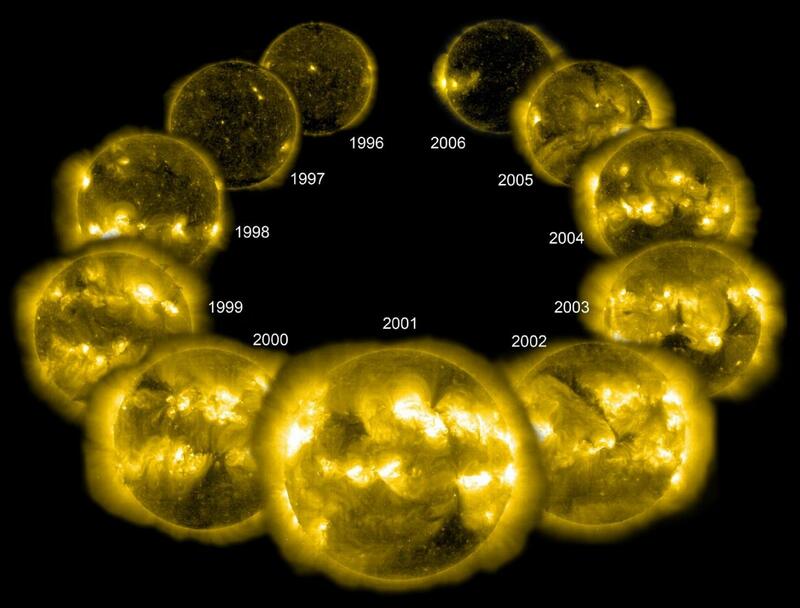 The Sun's so-called alpha-omega dynamo is subject to a regular cycle. Approximately every eleven years the polarity of the Sun's magnetic field is reversed, with solar activity peaking with the same frequency. This manifests itself in an increase in sunspots – dark patches on the Sun's surface which originate from strongly concentrated magnetic fields. "If you only just give a swing small pushes, it will swing higher with time," as Frank Stefani explains the principle of resonance. He and his team discovered in recent calculations that the alpha effect is prone to oscillations under certain conditions. "The impulse for this alpha-oscillation requires almost no energy. The planetary tides could act as sufficient pace setters for this." The so-called Tayler instability plays a crucial role for the resonance of the Sun's dynamo. It always arises when a strong enough current flows through a conductive liquid or a plasma. Above a certain strength, the interaction of the current with its own magnetic field generates a flow – in the case of the colossal Sun, a turbulent one. There is significant lack of clarity regarding the position and cause of the alpha effect, which uses the toroidal field to create a poloidal field – the latter running along the Sun's lines of longitude. According to a prevalent theory, the alpha effect's place of origin is near the sunspots, on the Sun's surface. The Dresden researchers have chosen an alternative approach which links the alpha effect to the right- or left-handedness of the Tayler instability. In turn, the Tayler instability arises due to strongly developed toroidal fields in the tachocline. "That way we can essentially also locate the alpha effect in the tachocline," says Frank Stefani. "Interestingly, we stumbled upon the Tayler instability in the context of our research into new liquid-metal batteries, which are currently being investigated as possible inexpensive storage containers for the strongly fluctuating solar energy," explains Frank Stefani. The fundamental principle of liquid-metal batteries is extremely simple. It consists of two liquid metals of differing densities – the electrodes – which are only separated by a thin layer of salt. The benefits are an extremely quick charging time, an (at least theoretically) infinite number of charging cycles and low costs, if a battery which is one square meter in size can successfully be produced. "For these batteries, the Tayler instability poses a serious danger because it inevitably arises when the cells get bigger and bigger. Without certain technological tricks, which we have already patented, the Tayler instability would destroy the battery's stratification," adds Stefani.